Hender Memorial Fountain | Launceston Then! Leon Hender, of Launceston, aged 18, youngest son of Mr. Thomas B. Hender, tanner, Launceston, had been with an elder brother on a visit to his uncle, Mr. John Holman, iron-founder, St. Just. The two brothers rode down on their bicycles on Friday week, and had arranged to return last Friday, but Leon, who had sustained a sprained ankle, was unable to leave, and his brother did the journey alone. On Saturday afternoon, a party consisting of Mr. Holman’s three daughters, two sons, and Leon Hender, drove to Lands End to spend a few hours. Young Hender, with Bostraze Holman, who was somewhat his elder, determined to bathe. The opportunities for bathing at Lands End are very limited indeed, and there is usually much sea as to make it impracticable. The two young men, however, descended the precipitous cliffs immediately in front of the famous Armed Knight rock, and proceeded to bathe. They seem to have made up their minds to swim to the Admiral Knight, a distance of about two hundred yards, and both started off together. When about half-way across Hender shouted to his companion that he was afraid it was too much for him, the current being so strong. They both turned to swim back, and in returning found the current much stronger. Hender appeared almost exhausted, and his companion went to his assistance with the hope of saving him. Hender grasped him round the neck and their legs became entangled, so that there was the utmost danger of the two lads going down together. Holman, however, managed to clear himself from his companion’s grasp, and Hender immediately sank, and was not seen again. Holman swam ashore with the greatest difficulty and was much exhausted, having had a very narrow escape. An alarm was raised, but there are no means of rendering assistance at the Lands End; and even had there been, it would have been of no avail, because but a very few moments elapsed between the first sign of danger and the disappearance of the young man. There is little hope of seeing the body for some days, the opinion being that the tides just here are so strong that it will be carried out some distance. The current is exceedingly strong at the Lands End, and it must have overpowered the deceased, who was a fairly good swimmer. Hender had just passed his examinations as a cadet on board the training ship ‘Worcester’.’ And was having a brief holiday before proceeding on a three year’s voyage. The sad news was received in Launceston on Sunday with general regret and expressions of sympathy for the parents. Mr. Hender and family were called out from the Wesleyan chapel, where they were attending morning service, to receive the sad information, and Mr. Hender left immediately for Penzance and the Lands End. The sad event was alluded to in most places of worship in the town in the afternoon and evening, and at the Wesleyan and Congregational P.S.A. Classes. Deceased was a bright intelligent lad and was much beloved. 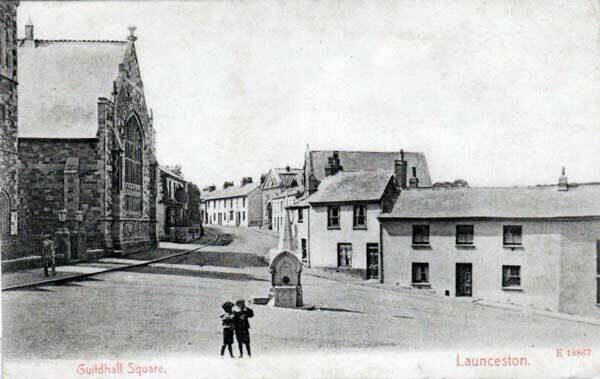 It is a curious coincidence that the deceased and Masters Laity Hender and Douglas Marshall, children of first cousins, have met with accidental deaths on Saturdays, the former having been killed by a fall from a tree whilst watching a cricket match (at Dunheved College) and the latter being drowned whilst bathing in the river Tamar. From another source we are informed: The distance between shore and the Armed Knight is 300 to 400 yards at high water; and on Saturday the current would have take four men to row against it 1½ to two hours ebb and it was close to spring tide. The lads did not know the strength of the current, and had never bathed there before. No one who knew the current would have essayed such a perilous task. They had been nesting on shore and swam towards the Armed Knight, expecting to find nests on that rock. They kept their faces towards the rock and for a time did not notice that they were drifting from in line with their staring point. Hender turned back, but did not shout, and apparently could not go out of the tide. Bostraze Holman went twice to his assistance and then found he would be drowned if he did not struggle to get ashore. Hender did not clinch him. The news was received with much regret at St. Just. Deceased, who was a bright young fellow, was a nephew of Mr. Richard Thomas and Mr. John Holman, and his father is a tanner at Launceston. The young man had served his apprenticeship on board ‘the Worcester’ training ship at Greenhythe on the Thames, and in three weeks would have started on his first voyage, to New Zealand, with Shaw, Saville and Co. The sad news was telegraphed to Mr. Hender and the parents came down on Saturday night and are still at the Lands End. They and the lads uncles made enquiries at Sennen on Monday but found the body had not been seen. A reward of £5 is offered for its recovery, but there is a strong probability that the body was carried out to sea. It appears that Leon’s body was never recovered, and as such the memorial fountain was placed at the Guildhall Square in his memory. 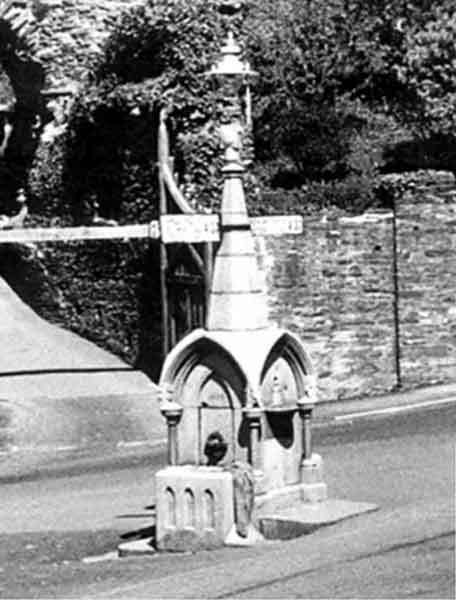 However, it proved not be a lasting memorial, with the advent of modern transport the ‘fountain’ was removed to improve the St. Thomas Road-Western Road junction. The whole memorial was dumped at the old Bangors tip, but part of it was rescued by the ‘Launceston Old Cornwall Society’ and placed at the Windmill reservoir (below left). Part of the top section was also rescued by a council workman and now sits as a garden ornament at Altarnun (below right).